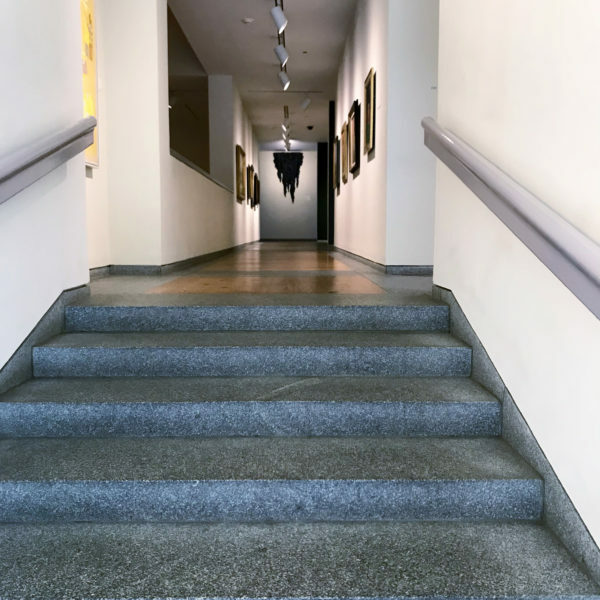 Located at 7 Congress Square, the Portland Museum of Art sits at an intersection of roads and art and culture and coffee. 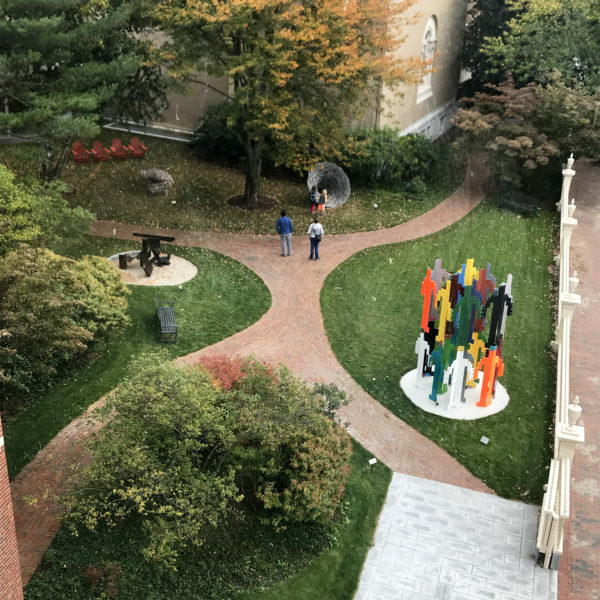 This public art institution was founded in 1882 as the Portland Society of Arts, and bears the distinction of being the oldest and largest public art institution in Maine. This is a place I have walked past dozens of times, but it wasn’t until a recent warm October Sunday that I stopped inside. 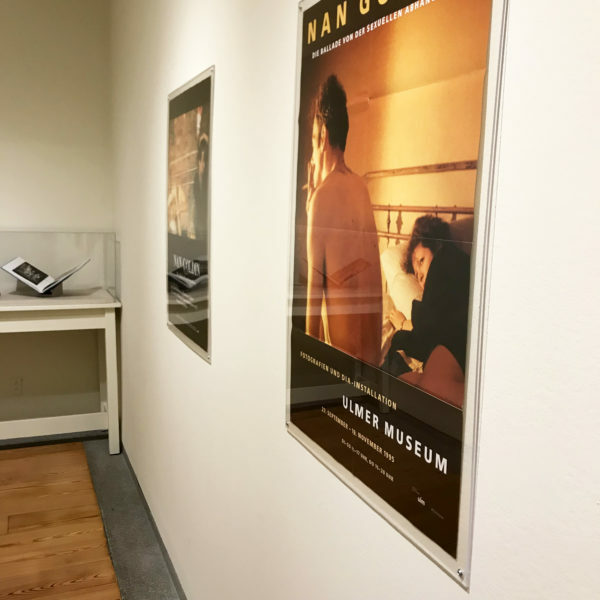 The museum is featuring several special exhibitions right now, including “Nan Goldin,” a collection of works by Nan Goldin including photos, slideshows set to music and books. The works are an intimate look into human experience, filled with raw imagery and honest emotion. I found myself mesmerized and drawn in while watching one of the slideshows, and remained there — watching in the dark auditorium — for awhile. I should note though: this exhibit probably isn’t for most kids. 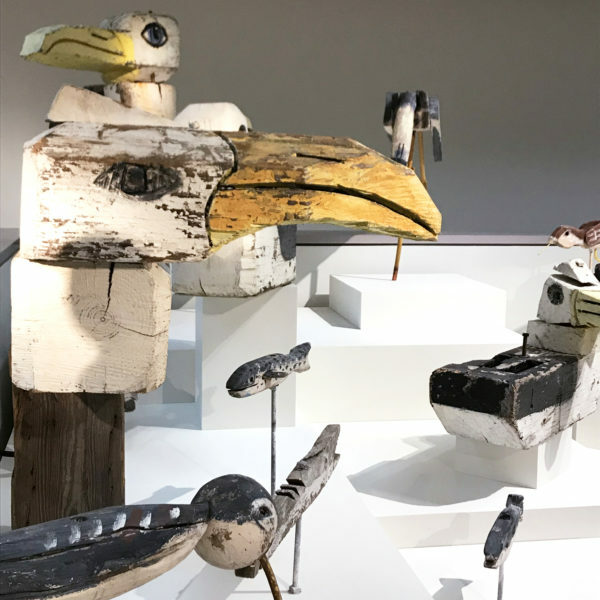 Bernard Langlais’s untitled bird and fish works are a mixture of paint, wood and metal. There’s so much to see at the Portland Museum of Art. Across multiple floors and in galleries in two (attached) buildings, there’s a variety of work and mediums. Among the art that spoke to me was this collection of birds and fish by Bernard Langlais located in the Modern Menagerie gallery on the fourth floor. Though not true to life, the seagulls and fish reminded me of summers in Connecticut. These sculptures once were displayed at the Samoset Resort in Rockport, Maine. Other pieces, like this painting by N.C. Wyeth held my gaze for awhile. Studying both the style and the story, I was surprised by how much I liked this painting despite its obvious stress — a battle of survival. One of the things I loved most though, was the efficient use of space and light. Tall windows in stairwells gazed out on sculptures like this one. 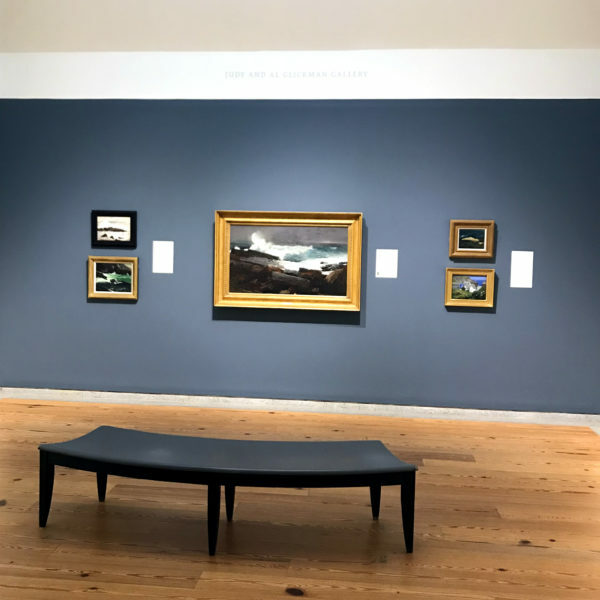 A recent renovation worked to improve the use of space for displaying art — so the museum shows more from their permanent collection now than they have in the past. Every hallway was filled with more to look at — wasted space? Not here. 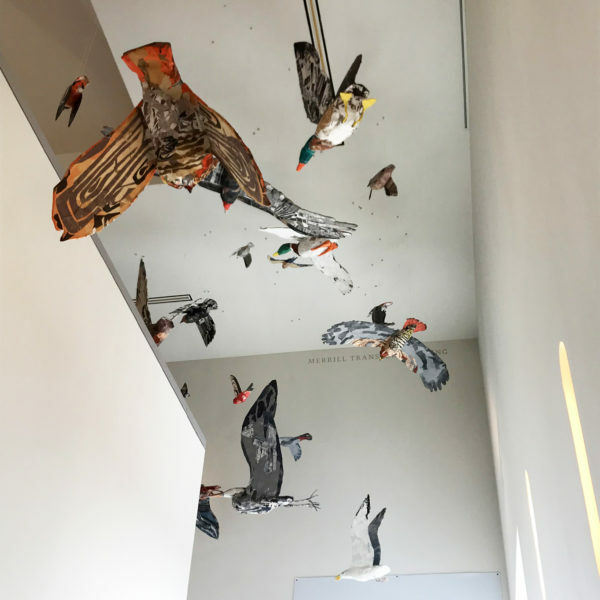 This installation of papier-mache birds by Christopher Patch is called Migration. Seeing them from different angles altered the experience and understanding of the installation — it was lovely. 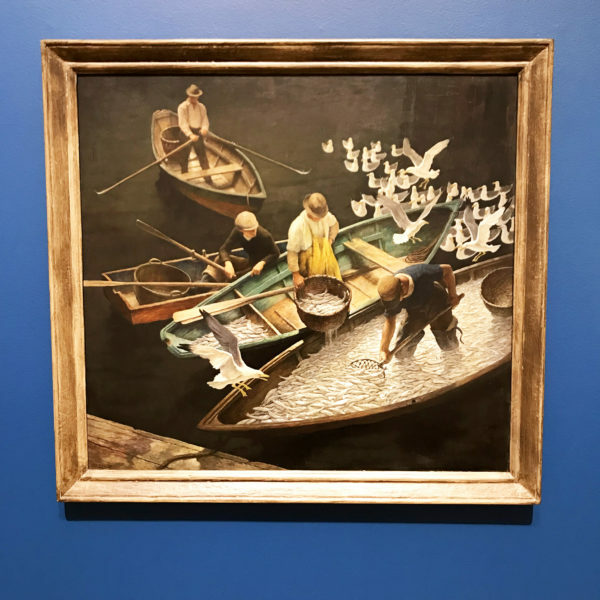 From Winslow Homer to Dahlov Ipcar, Richard Estes to Ansel Adams, there’s an extensive collection on display to experience at the Portland Museum of Art. If you, like me, appreciate a stroll through an art museum, pausing for greater inspection and appreciation, then you should definitely stop here. The Portland Museum of Art is presently operating on their winter hours schedule. They are open Wednesday through Sunday beginning at 10 a.m. They close at 6 p.m. every day except Thursday and Friday, when they close at 8 p.m. Admission varies based on day, time, age and more. I paid $15 on that recent Sunday, but it’s less for students and seniors. Children under age 14 are always free and there’s a free admission period every Friday evening as well. Sarah Walker Caron is a cookbook author, freelance writer and founder of Sarah’s Cucina Bella. She is the author of several cookbooks including The Super Easy 5-Ingredient Cookbook and One-Pot Pasta, both from Rockridge Press. A single mother to two kids in middle school, Sarah loves nightly family dinners, juicy tomatoes plucked fresh from the vine and lazy days on the beach. She also adores reading and traveling.